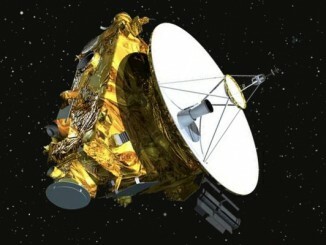 Clicking on the graphic above loads a 1:10 scale version of the full resolution Pluto map just published based on imagery acquired by NASA’s New Horizons spacecraft 7-14 July 2015. A link to the full resolution image for high-specification desktop computers with RAM to spare is included in the article below. Image credit: NASA/Johns Hopkins University Applied Physics Laboratory/Southwest Research Institute. The science team of NASA’s New Horizons mission has produced an updated global map of the dwarf planet Pluto. The map includes all resolved images of the surface acquired 7-14 July 2015, at pixel resolutions ranging from 40 kilometres (24 miles) on the Charon-facing hemisphere (left and right sides of the map) to 400 metres (1,250 feet) on the anti-Charon facing hemisphere (map center). Many additional images are expected in autumn 2015 and these will be used to complete the global map. 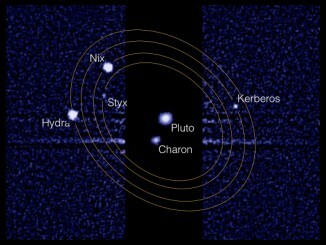 The New Horizons spacecraft flew past Pluto and its moons on July 14. For high-specification desktop computers with RAM to spare, a full resolution (18630 by 9315 pixel, 5.221MB) version of the above image is available by clicking here. 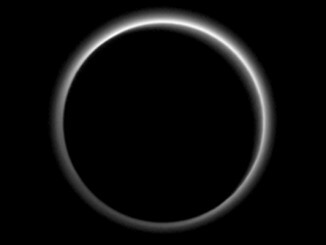 Backlit by the Sun, Pluto’s atmosphere rings its silhouette like a luminous halo in this image taken by NASA’s New Horizons spacecraft on July 15. This global portrait of the atmosphere was captured when the spacecraft was about 1.25 million miles (2 million kilometres) from the dwarf planet.